SkyStem is delighted to share our latest award from Capterra (a Gartner Company). These independent reviews are illuminating. I’m most pleased to see that, as a company, we are serving customers in a way that’s true to our core philosophy. SkyStem is delighted to share our latest award from Capterra (a Gartner Company). We received the “Best Value” badge for which we are so thankful to our customers. 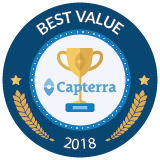 Capterra, the world’s leading digital software marketplace, awarded the badge to SkyStem based on numerous positive product reviews of ART -- SkyStem’s month-end close and balance sheet reconciliation solution. ART is known for delivering robust functionality and “high touch” customer service to our market -- all at a competitive price point that maximizes immediate return on investment. Thank goodness for Skystem. We'll be clients for life! ART resulted in immediate efficiencies to the reconciliation management process. It saves time, which is important if you have a lot of accounts. This product has been very helpful in standardizing our reconciliations...Our internal and external auditors have all the reconciliations at their fingertips along with the sign off trail. ART is a definite improvement from what we were using before for our monthly balance sheet account analyses. A big step up from three-inch binders. “These independent reviews are illuminating. I’m most pleased to see that, as a company, we are serving customers in a way that’s true to our core philosophy – delivering tremendous value, having great customer service, maintaining high expectations for ourselves, and mixing in a bit of fun. We always look at feedback like this for guidance to our path ahead,” said Shagun Malhotra, CEO of SkyStem. Headquartered in the heart of New York City, SkyStem delivers a powerful close and account reconciliation application for organizations seeking to streamline their financial processes. The company’s flagship solution, ART, is an enterprise technology that helps CFOs and Controllers shorten the month-end close and the time to issue financials by automating balance sheet reconciliations, managing month-end tasks, and providing insightful reporting. The web-based solution streamlines and eliminates up to 90% of manual activities while strengthening internal controls and corporate governance. Learn more at http://www.skystem.com.